The record is made up of 1 volume (135 folios). It was created in 30 Jan 1926-27 May 1931. It was written in English. The original is part of the British Library: India Office The department of the British Government to which the Government of India reported between 1858 and 1947. The successor to the Court of Directors. Records and Private Papers. oliticai evident in the ereian Gulf. the s e ap jo in tmen t b .
employ would oe more likely to accumulate his leave. and simple and would serve for a considerable ijeriod ol years. in the foreign and oiitical department, Telhi. Correspondence discusses the Muscat Levy Corp: its organisation, composition, strength, budget and activities. A report by Captain George J Eccles on the progress of the Muscat Levy Corps from July 1924 to May 1926. Sections include: organization; personnel (officer and other ranks); strength; armament; clothing and equipment; health and sanitation; public works; training and discipline. A report by Captain Robin William George Stephens for the period 11th May 1925 to 11th May 1928; the report is divided under the headings: efficiency; discipline, budget, strength; financial; armament, public works, equipment, clothing; non-military activities; miscellaneous; recommendations. Lionel Haworth, Political Resident A senior ranking political representative (equivalent to a Consul General) from the diplomatic corps of the Government of India or one of its subordinate provincial governments, in charge of a Political Residency. in the Persian Gulf Historically used by the British to refer to the sea area between the Arabian Peninsula and Iran. Often referred to as The Gulf or the Arabian Gulf. , wrote to the Foreign Secretary to the Government of India commenting on the report by R.W.G. Stephens. 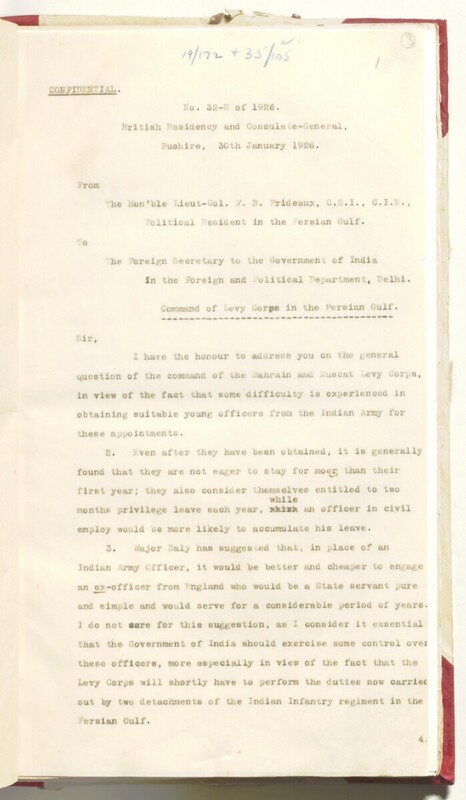 A letter from Trenchard Craven Fowle, Political Agent A mid-ranking political representative (equivalent to a Consul) from the diplomatic corps of the Government of India or one of its subordinate provincial governments, in charge of a Political Agency. , Muscat, to the Political Resident A senior ranking political representative (equivalent to a Consul General) from the diplomatic corps of the Government of India or one of its subordinate provincial governments, in charge of a Political Residency. in the Persian Gulf Historically used by the British to refer to the sea area between the Arabian Peninsula and Iran. Often referred to as The Gulf or the Arabian Gulf. . Policy for Muscat Levy Corps. This letter reviews the object of the Muscat Levy Corps and argues against a reduction in strength of the Muscat Levy Corps. Captain Allan Robertson Walker, Commandant, Muscat Levy composed a report on 'Future Policy for the Muscat Levy' including a 'Table of Budget Estimates and Actual Expenditure of the Muscat Levy from 1922 to 1930'. Captain Walker also produced a report on the Muscat Levy Corps from May 1928 to May 1931. In response to requests in 1931 from S.E, Hedgcock, Financial Adviser, for financial savings in the Muscat Levy Corps, Captain Walker comments on the road building capacity of the Levy as it achieves this for the State without cost of additional expenditure. Correspondence discusses cuts in pay in the Muscat Levy to achieve financial savings given the financial situation of the Muscat state and the position of the Government of India. Data included is a comparison between the pay of the Muscat Infantry and that of the Customs Department. Correspondents include Robert William George Stephens; Allan Robertson Walker, Commandants, Muscat Levy; Trenchard Craven Fowle, Political Agent A mid-ranking political representative (equivalent to a Consul) from the diplomatic corps of the Government of India or one of its subordinate provincial governments, in charge of a Political Agency. , Muscat; Francis Beville Prideaux, Political Resident A senior ranking political representative (equivalent to a Consul General) from the diplomatic corps of the Government of India or one of its subordinate provincial governments, in charge of a Political Residency. , Persian Gulf Historically used by the British to refer to the sea area between the Arabian Peninsula and Iran. Often referred to as The Gulf or the Arabian Gulf. ; Foreign Secretary to the Government of India. The papers are arranged chronologically from front to rear of file. Foliation: There is an incomplete foliation sequence and a complete foliation sequence. The complete sequence, which should be used for referencing, is circled in pencil, in the top right corner of the recto The front of a sheet of paper or leaf, often abbreviated to 'r'. of each folio. It begins on the title page, on number 1, and ends on the last folio of writing, on number 135. Foliation errors: f.1 is followed by f.1A.